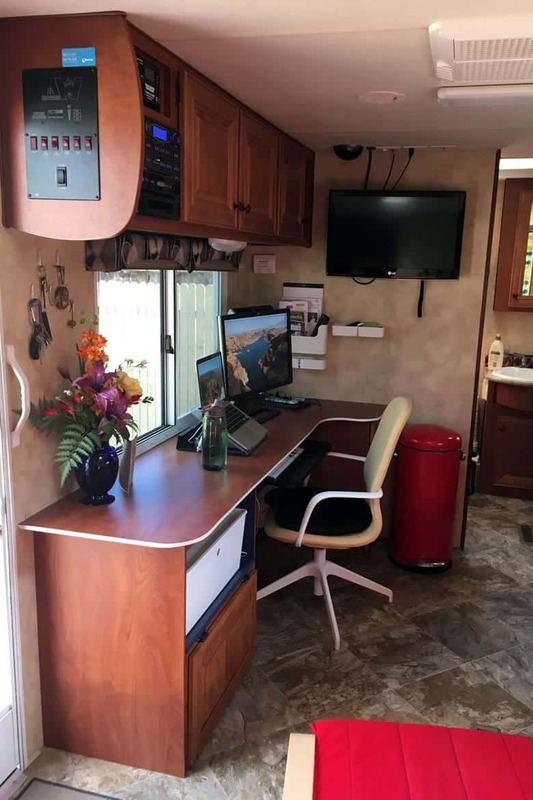 Some of you may remember that I redid the RV kitchen area back in January, 2016 – this time I redid my desk area! Unfortunately, I couldn’t get slide outs with this RV. Slide outs add a considerable amount of weight which I wouldn’t have been able to pull with my Toyota Tacoma. 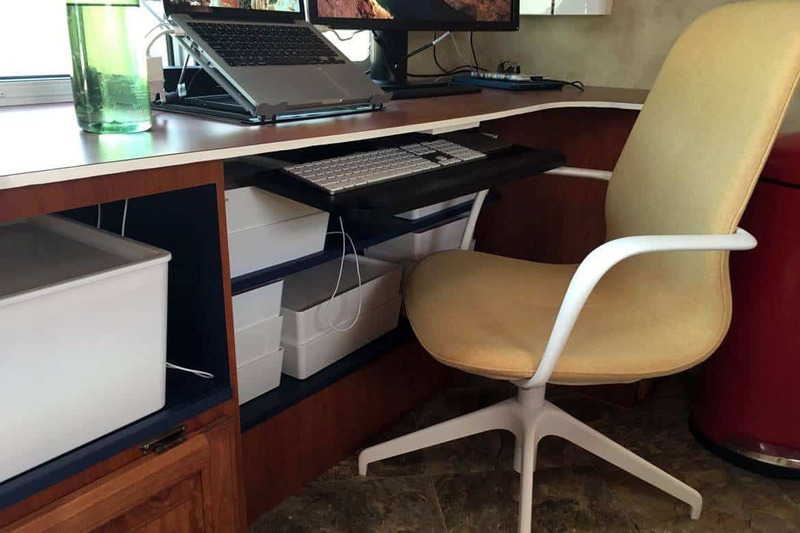 Slide outs also ADD a considerable amount of space which I really wish I had but – I’ve added quite a bit of space just by renovating what I do have. As with the kitchen renovation, I needed to add functional space; shelves were important and I wanted enough space for my laptop and monitor. I also wanted enough room so that the foot stool I bought from IKEA could easily be maneuvered around without banging shins. I’ve always disliked the dinette area and I’d been using it for my desk, for the most part, but it just took up a lot of space. I had to cover up a heating duct. I had to build to cover up electrical wiring that came up through the floor. I had to build an area for the outside storage access which was originally under the bench seat closest to the wall. I’ve never built anything that required doors. NOTHING in the RV is square. 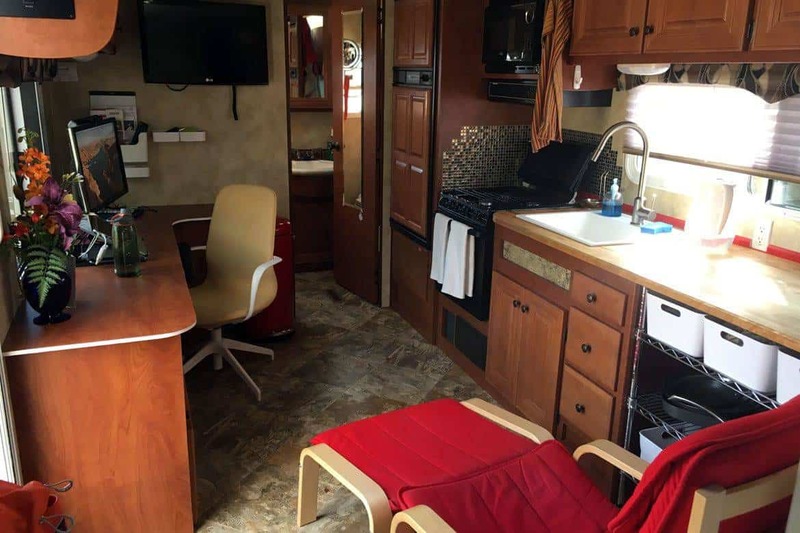 This is the original layout of my RV (above). 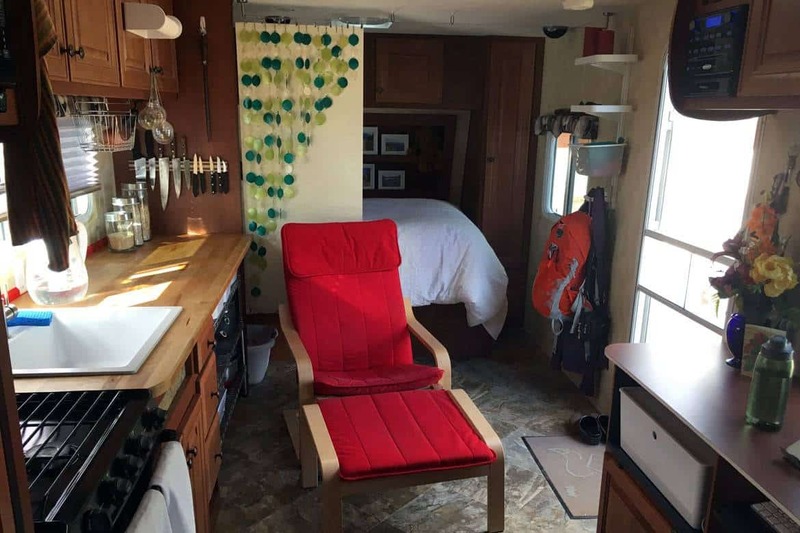 I’d already removed the sofa and added an additional 4′ of counter space. 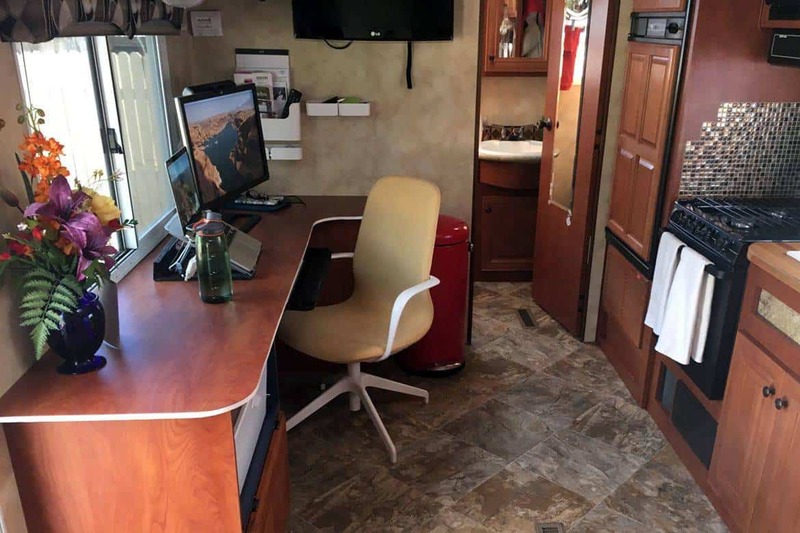 The image above (that I “borrowed” from online) shows the original layout with the dinette area and the image below – shows my RV after renovations from approximately the same camera angle. Everything was constructed with 1/2″ birch plywood and 1×4″ pine and my good friend, Mark, lent me most of the tools I needed for the project. THANK YOU MARK! I’m not fond of the white band around the edge of the top but I’ll stick with it for now. The cherry doors were custom ordered from Fast Cabinet Doors and were very reasonable and beautifully made. IKEA supplied the desk chair and all the white storage containers. I was originally going to do the top with blue laminate but found out that it scratched way too easily so I went with the cherry instead. … And I have to say, laminating isn’t my favorite hobby. You can see the heating duct that I had to cover up (at the bottom). The keyboard tray was purchased from Amazon and it swivels if needed. The wall behind the shelving and on the top of all the shelves is blue laminate. I had some blue paint made up to match and added a little bit of molding on the edges of the shelves to hold things in place while the RV is moving. The privacy screen (also from IKEA) is just big enough to hide all the glowing lights/buttons in the RV while I sleep. lol! The capiz shells are something a friend gave to me that remind me of Hawaii. 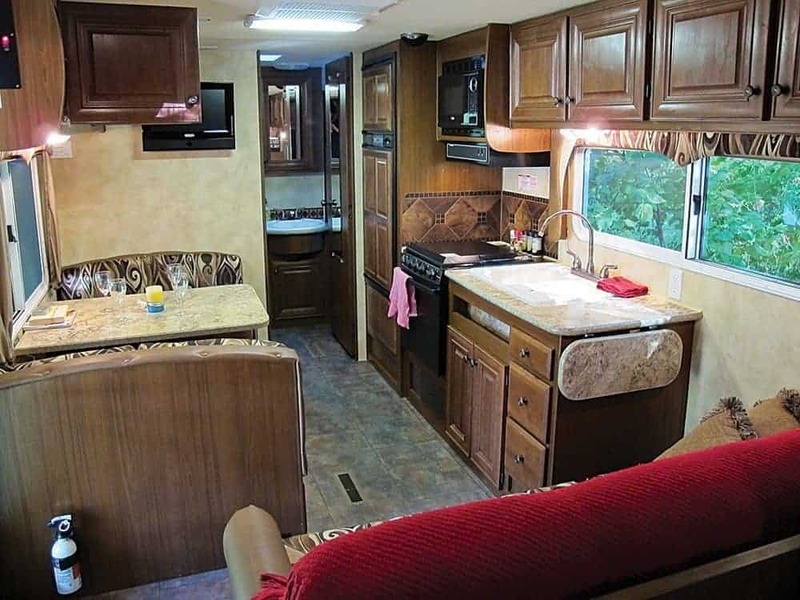 All in all, I added about 10sf of floor space by removing the dinette. There’s no “eating area” now but I make due. On a side note: I don’t have any place for guests unless you’re sleeping in my bed or on the floor! LOL! Back in Buena Vista, Colorado – with a new friend! That is on beautiful RV! Great renovations!